was an artist who had an Anglo-French career which was without parallel in the nineteenth century. From 1864 to 1871 he had painted in Paris but the Franco Prussian war, in which he had helped with the defence of Paris, had ruined the French art market and he fled to England, arriving there penniless. He sheltered with Thomas Gibson Bowles near Hyde Park who gave him a job producing cartoon portraits for the magazine Vanity Fair. Best at painting what he saw in front of him, he started painting the glamorous world of London society in an individual style which is instantly recognised. 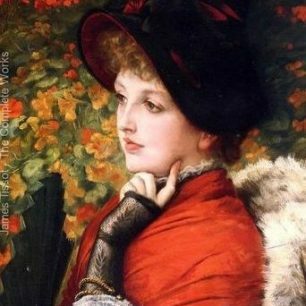 To us it seems “high society” but to contemporaries it was not an aristocratic society but one filled by the vulgar new rich middle class, in which there were no “real ladies”. 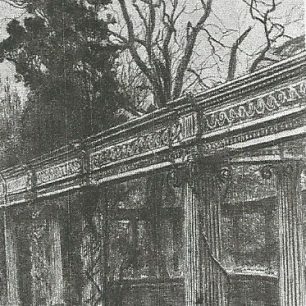 Scoring immediate success with the portrait of “Captain Burnaby,” followed by “Too Early” and “Hush”, both of which were bought by Agnew the dealer, he moved to 73 Springfield Road in St Johns Wood, followed by 17 Grove End Road in 1873. 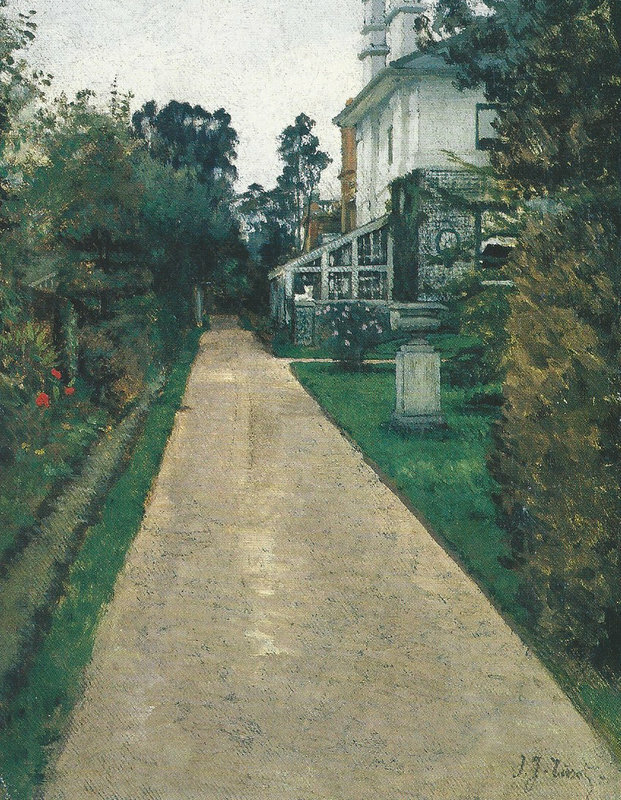 Tissot added a studio salon to the villa, surrounded the pond with an Ionic colonnade and built a red brick gardener’s lodge. 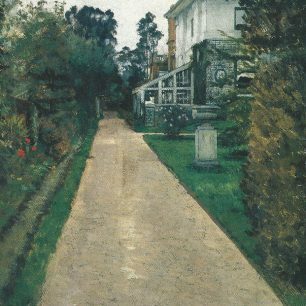 He also built a conservatory which often featured in his paintings., where he grew fine double chrysanthemums, which (as Robin Lane Fox pointed out in the Financial Times 11 November 2017), had emerged as “the new marvel among cut flowers”after Japan opened up to the West from 1860 onwards. By 1876 he was living with Katherine Newton, a girl who had married Isaac Newton, a surgeon in the Indian Civil Service but who had had an affair with a Captain Palliser on the way to India. After Newton divorced her, she lived with her sister and brother-in-law, Mary and Augustus Hervey, a colonel in the Indian army, living at 6 Hill Road in St Johns Wood, and at some period had another child. Katherine, wearing a yellow headscarf and shawl ,was painted tending the white chrysanthemums in the conservatory in 1876. Even though their relationship was outside the bounds of English society, life with her and her children was the happiest period in Tissot’s life and his pictures became more domestic, with children and interiors featuring. Critics referred to these paintings as “pictures of the detached villa kind” knowing that readers would understand what was hinted at. 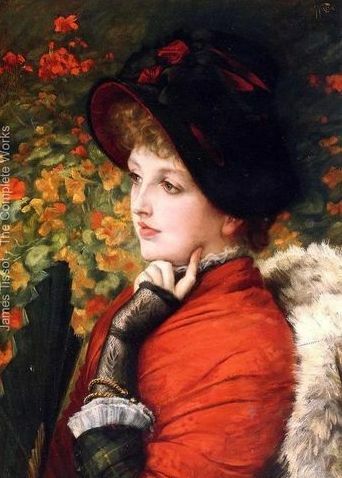 But she died of TB in 1882 and five days later, Tissot left St Johns Wood . 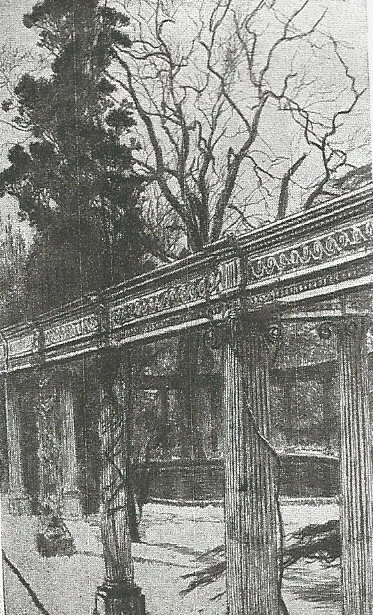 I love the pictures and the background to Tissot’s life which you have unearthed.